The underground Church not only suffered long years of persecution from the government, it also suffered intense emotional pains in recent years from the insensitive treatment and criticism from some members of the universal church. The steadfast loyalty and obedience of the underground Church to the Pope were interpreted by many as inflexibility and hostility towards the communist government sanctioned Patriotic Association (P. A. ); its refusal to join the P. A. is allegedly the reason for the continued division of the Catholic Church in China. Some "China experts" from the universal church felt strongly that unity in the Catholic Church in China will be achieved only if the underground bishops will put away their past and join the so-called "open church". Consecrate a P. A. priest of that same diocese as his coadjutor bishop. By virtue of the same letter, the incumbent underground Ordinary appointed by the Holy See to the same diocese was demoted to the position of auxiliary bishop to the newly appointed P. A. Ordinary. This good underground Ordinary is now in hiding. The entire underground Church in China is perturbed at how this loyal underground bishop who had been jailed and tortured by the Chinese government many times could be demoted and be forced to report to a P. A. bishop. The underground clergy and faithful of this diocese are now under great pressure both from the government and from their new P. A. bishop to join the Patriotic Association. I must say that forcing an underground Ordinary to report to a P. A. bishop must be the most effective method yet conjured up by the Chinese Government to erode the fidelity of the underground Church to the Supreme Pontiff. I have known of this event for almost a year and have tortured myself in trying to keep it confidential in the hope that the Vatican could resolve this issue. It has not been resolved. In the meantime, this event has now been reported in the United States. 2) Another American Parish Granting Full Faculties to the Patriotic Association Priests. Following the "example" of the New York archdiocese, Archbishop Levada of San Francisco granted faculties to a P. A. priest a few months ago, allowing him to offer Holy Mass and administer other Sacraments in public. The fact that this priest was a P. A. priest was not disclosed to the faithful. It is quite natural for any individual receiving Sacraments from these P. A. priests in a R. C. Church to believe that they are the R. C. priests. Would these same individuals still wish to receive the Sacraments from this P. A. priest had these facts been told? Another rather delicate point is the question of the liturgical celebrations. In fact, all 'communicatio in sacris' is to be avoided. The 'patriotic' bishops and priests are not to be invited or even allowed to celebrate religious functions in public, either in the churches or in the oratories of the various religious institutes. When we raised questions to Archbishop Levada who sponsored this program, his answer was that this program "is being carried out according to directives received from the Holy See" without further specifics. When we asked him again for more details, we did not receive his response. The P.A. bishops publicly and repeatedly stated that the Pope has no authority over the Catholics in China, repudiating the Pope's supreme legislative, executive, and judicial authority to govern the entire Catholic Church. The P.A. priests studying in U.S. are under the sponsorship of the P.A. bishops, consecrated by the P.A. bishops and are committed to return to serve these P.A. bishops and the P.A. diocese. Pope John Paul II has said quite plainly that "a Catholic(s) who wish(es) to remain such and to be recognized as such cannot reject the principle of communion with the successor of Peter"(Jan 1994, Manila). In view of the above publicly known facts regarding the Patriotic Association priests and the Holy Father's statement, they cannot be considered in communion with the Pope, nor are they even Roman Catholic priests. As such, how can they be granted full faculties in the United States to administer Sacraments in public? As the P. A. priests and seminarians have publicized their continued commitment to return to serve their P. A. bishops, (some have returned), they could not have made a true lifelong conversion to the R. C. Church. The "proof" of their allegiance to the Pope is to recite once in private the Profession of Faith. This same prayer is also recited in China, but did not deter these P.A. bishops from upholding the principle of an independent Chinese Catholic Church, or from publicly proclaiming that the Pope has no authority over Catholics in China. How, then, can a public scandal be rectified with one "private" recitation of the same profession of faith? The United States faithful deserve to know the true position of these P. A. priests on the doctrine of the papal supremacy. Many clergy in the free world felt that the P.A. clergy is justified in joining the Patriotic Association because of persecution. Throughout history, the same reasons have caused different groups to be separated from the Church. Many clergy joined the Church of England because of the persecution under Henry VIII. However, was St. Thomas More inflexible, outdated or sacrificed needlessly? Was Bishop St. John Fisher not facing a political reality? The separation of the Church of England and that of the Patriotic Association are rather similar. Therefore, at most, the P. A. clergy can only be as "catholic" as the clergy from the Church of England were "Catholic". While we cannot ignore the truth that they "have strayed in certain aspects from the fullness of Catholic truth" (Pope John Paul II), we must love and pray for our separated brothers so that they may return to the "One fold and One Shepherd". Pope John Paul II is well known for his deep love for China. Being a former underground seminarian himself, the Holy Father understands only too well the painful reality and suffering of a persecuted Church in a communist country. However, charity must also be based on truth. In his speech to China in December 1996, the Holy Father encouraged and demanded fidelity from the bishops. He said, "Through ordination the Bishop receives the grace and the responsibility of his own pastoral ministry.....The Bishop must be the first witness of the faith which he professes and preaches, to the point of 'shedding his blood', as the Apostles did and as so many other Pastors have done down the centuries, in many nations and also in China." By what kind of theological reasoning do P.A. priests receive full faculties to administer Sacraments openly in the Roman Catholic Church? Is this a change in Vatican's policy, as previously the Holy Father has not recognized the Patriotic Association? Is a basic doctrine of faith, e.g. communion with the Vicar of Christ, dispensable when one is under persecution? There are approximately fifty P. A. seminarians and priests studying in various R. C. seminaries in the United States for at least the last 6 years. Maryknoll on behalf of the P. A. Seminarian Formation Committee organizes this program. 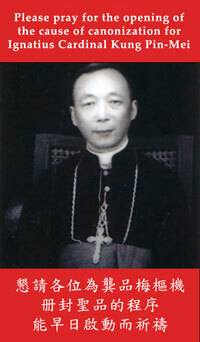 The chairman of the Committee is Bishop Aloysius Jin, the P. A. 's Bishop of Shanghai. Bishop Jin often presented to his western benefactors his 18 years of imprisonment as proof of his loyalty to the Holy See. What he did not say was that soon after his arrest, he caved in to the pressure of the communist government and recorded a tape to persuade the jailed Catholics to confess to the government and to join the Patriotic Association. This tape was broadcasted in prison. He in fact chose to serve the communist government from the very beginning of his imprisonment, rather than to serve the Vicar of Christ. Soon after his release, he was awarded the position of P.A. auxiliary bishop of Shanghai, and then the P.A. Bishop of Shanghai. Many bishops in the United States support Bishop Jin's seminarians' program and offer these candidates full tuition, room, and board scholarships. At the end of the training, the candidates are sent back to China, to be ordained by P.A. bishops and to serve in the Patriotic Association. The U.S. seminaries are not training them for the underground Roman Catholic bishops. The U.S. bishops alleged that this program has " the approval of Vatican". However, those who have written to the bishops, to the rectors of these seminaries, or even to Vatican officials failed to receive any explanation as to why the diocese and the Holy See promote an independent Church who has repeatedly and openly declared its autonomy from the Pope. Section 678 of the Canon Law stated that all religious organizations working in a diocese must receive the approval from the Ordinary of that diocese. In recent years, many missionaries returned to China and started various charitable projects. These foreign missionaries do not seek permission for their projects from or work with the underground bishops who were appointed by the Pope. Instead, they work with the Patriotic Association or with the communist government. It is very sad to note that the R. C. missionaries of the free world ignore their duly appointed bishops and prefer to serve bishops approved by the communist government. I personally cannot imagine that any religious orders would carry out an unauthorized project in a diocese of the United States. If this unauthorized ministry indeed should not happen in the United States or elsewhere in the world, why should it occur in China? Why then the double standard? Numerous articles have appeared in the diocesan newspapers, and Catholic magazines, about the "Catholic Church in China", but in fact describing the P. A. without naming it as such. Numerous tours to China have been organized by Roman Catholic institutions such as the China Bureau headed by a Maryknoll sister. These tours were advertised to visit churches and seminaries of the "Catholic Church in China", but in fact, they visited the P. A. 's facilities. Many conferences have been sponsored by R. C. institutions such as the U. S. National Conference of Catholic Bishops ostensibly for the "Catholic Church in China", but in effect focused mainly on the P A's church. Along the way, the loyal underground Catholic Church, its persecutions and sufferings were scarcely mentioned, if at all. These articles, tours and seminars have badly deceived the public. Besides showing "charity" to our separated brothers by generously supporting the P. A. with the resources of the universal church, the leaders of our Church in America should also teach loyalty and obedience to the Vicar of Christ by supporting and preaching about the suffering underground Church in China as an example to the Catholic Church in America. 6) Is The Patriotic Association The Same As The Roman Catholic Church? Recently, many religious and bishops claim that the underground Church and the P. A. Church are the same Church having the same faith. They advocated not taking sides, because we are all Catholic. This view is totally wrong. The most important tenet in the constitution of the Patriotic Association is its autonomy from the Pope. It does not recognize the supreme administrative, legislative and judicial authority of the Pope regardless of the fact that its members publicly professed their "loyalty" to His Holiness. This autonomy is the fundamental divergence in theology between the Patriotic Association and the Roman Catholic Church. We know that no one can possibly claim communion with the Pope and with the universal church while simultaneously denying the administrative, legislative, and judicial authority of the Roman Pontiff. Inasmuch as the Patriotic Association refuses to recognize the Pope's authority as stated in their constitution, it could not possibly be in communion with the Pope. Without such communion, the Patriotic Association could not be Roman Catholic. Cannon Law Section 751 states "…Schism is the refusal of submission to the Roman Pontiff or of communion with the members of the Church subject to him." The Patriotic Association continues to refuse submission to the Roman Pontiff. Its bishops continue to be consecrated without a papal mandate. This has been done for the last four decades. Patriotic Association priests and bishops, presenting themselves as bona fide Catholic clerics, traveled around the world and solicited donations. Catholic institutions donated millions to the Patriotic Association while the underground loyal bishops were left with almost nothing. Unfortunately, the expression of the loyal bishops is severely limited. They are prohibited to do so in China because of their illegal status, and are not allowed to travel outside China to spread their message. The mission of The Cardinal Kung Foundation is therefore to bring the message and the life of the underground Church, and its continued persecution, to the world's attention. It is one matter to donate money out of an ecumenical spirit to our separated brethren. 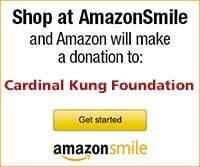 It is even more necessary to support our loyal Catholic brethren in China who are suffering so much for the faith. As we have stated above, such donations, if any, are nominal. In the meantime, horrendous persecution of the underground Church continues. Many Cardinals and Bishops claim that they carried out the above events to promote "reconciliation", as directed by the Holy See. Reconciliation cannot be done by compromising faith. Reconciliation is possible only with "full and complete visible union of Pastors and faithful alike, around the Pope." The Holy Father "exhorts all the Pastors and the faithful of China to express with courage and without fear the true profession of Catholic faith, 'thus speaking the truth in love'." (J P II 12/96). Many Roman Catholic bishops and missionaries believe that working with the Patriotic Association Church would be the most effective means of propagating the faith in China. If this were their true objective, these institutions should first consult with the loyal underground bishops who have over 40 years of experience under communist China, increasing the loyal underground Church from 3 million in the 1959's to the current 8 million. They have not consulted with the underground bishops. These religious orders did not extend the same respect to the underground bishops as Ordinaries as they would have accorded to other Ordinaries in the free world. These Bishops and religious superiors appear to support and recognize the Patriotic Association while our Holy Father has steadfastly refused to do so. The 8 million loyal Catholics are very broken-hearted and confused. In their hearts, they know that "Papal Supremacy" is one of the fundamentals of being a Catholic. In their hearts, they know that Holy Father is firmly behind them. In their hearts, they know that Holy Father will never abandon them. However, facing all these confusing and contradicting events, the loyal Catholics are experiencing a far more painful persecution by the acts of our own Church than being just physically abused and locked up in a communist jail. The Communist Government did not succeed in eliminating the millions of Catholics by coercion and persecution for almost five decades. Now the Government is hoping to defeat the Roman Catholic Church from within through misinformation, deceit, and confusion in addition to the forty years of intensified persecution from without. The Chinese Government is trying hard to erode the respect, confidence, obedience and loyalty of the underground church to the Holy Father through the current confusion and conflicting signals. So, when the chips are down, the issue of the papal authority of the Catholic Church in China would become irrelevant. We are most concerned that the communists are gaining ground rapidly. Please help China and the underground Bishops with your prayers, your voice and your sacrificial donations. We need you, and your friends.